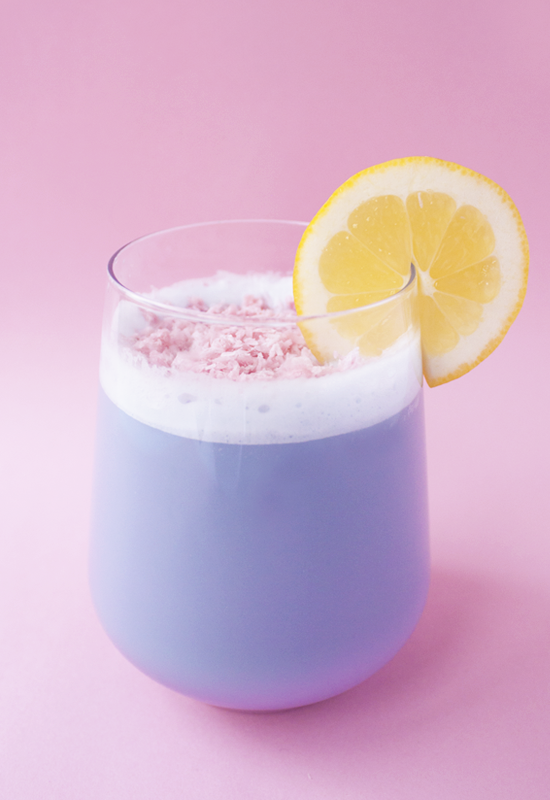 This blue butterfly pea coconut shake with macadamia nuts is a creamy, naturally sweet drink full with healthy fats and nutrients. The beautiful blue color comes from South-East Asia’s native butterfly pea flower. It is a plant with blue flowers that is mainly used to make herbal tea. Butterfly pea flower is rich in antioxidants and caffeine-free. While it’s been used inSouth-East Asia for centuries, it is relatively new in the rest of the world. It has recently become very popular as a natural food coloring for different types of food and drinks. Depending on the concentration, you get different shades of blue ranging from soft baby blue to a deeper blue. You might have seen the rainbow and unicorn food trend with naturally colored smoothies, ice-cream, toast, noodles, cakes and more. 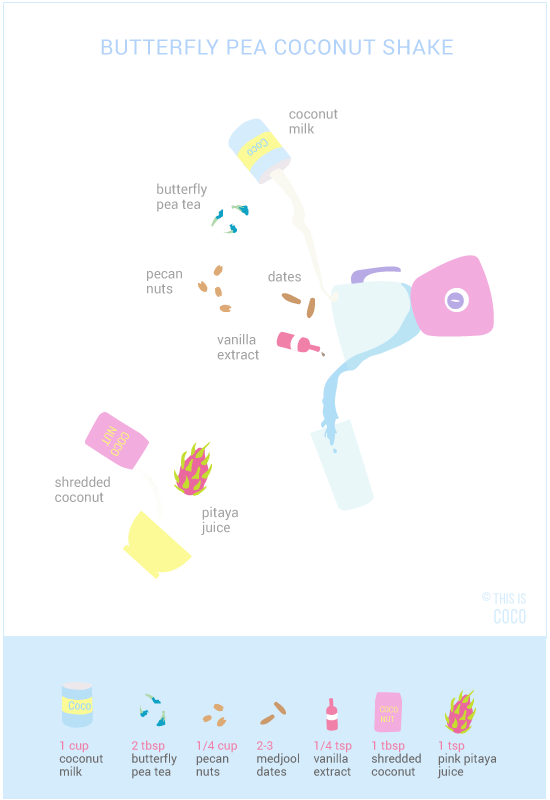 The beautiful natural blue in these foods comes from either butterfly pea or blue spirulina. I also used butterfly pea flower to color these rainbow bounty bars. Both the liquid tea as well as the powder can be used. The power is however the most versatile to use, because liquids don’t mix with all (solid) foods. It is fairly neutral in taste and sort of resembles very light, unsweetened green tea. You can add a sweetener to it, ginger and lemon. The lemon actually does something very special to it. It changes its color from blue to purple to pink which is beautiful! Use chilled coconut milk from the refrigerator. 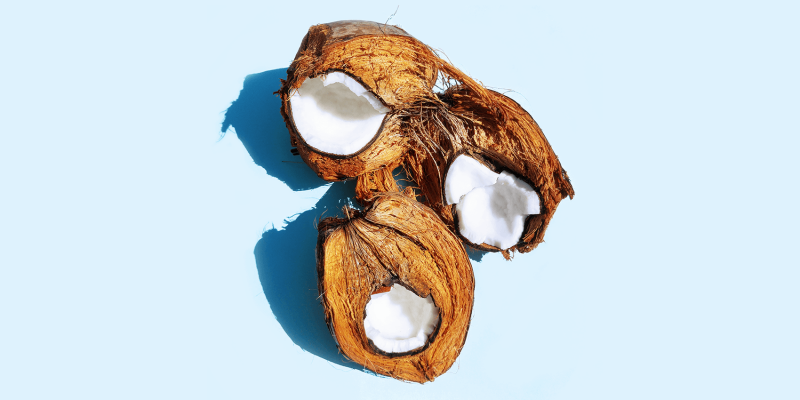 Homemade coconut milk works great, but a natural brand of coconut milk is also good. Blend the coconut milk with the medjool dates. If you don’t have medjool, you can use different dates, but make sure that they are soft and juicy. Soaking them in a bit of water for a few hour helps soften them. If you use soaked dates, you can also use some of the soaking water which adds sweetness. The bright blue dried Butterfly pea flowers can be used either as tea or as powder. Just add a bit to your coconut shake to give it the beautiful blue color. Mix the shredded coconut with the juice of a pink pitaya or beet and sprinkle it on your butterfly pea coconut shake.